Dental bonding is a technique in which a tooth-colored resin material (a durable plastic material) is applied and hardened with a special ultraviolet light to recover or refine smile. Some preparations are needed for dental bonding. Anesthesia is normally not used unless the bonding is being used for a decayed tooth filling. A shade guide will be used to choose a composite resin color that will match the tone of your teeth. Next dentist will rough the surface of the tooth and will apply a conditioning liquid. These will help to stick the bonding material to the tooth. The resin shaded like a tooth then will be applied, molded, and smoothed out to the desired shape. Laser or ultraviolet light is then will be used to harden up the material. Then your dentist will trim it and shape and polish it to coincide the gloss of your teeth surface. It will take up to one hour per tooth to for dental bonding procedure. 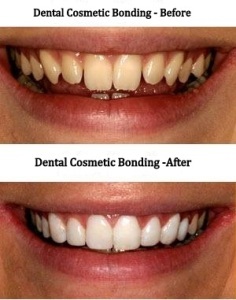 Dental bonding is an easy and affordable cosmetic dental procedure. It usually can be completed during one visit unless several teeth are damaged. The big advantage is that only little amount of enamel is removed during the procedure. One of the biggest disadvantages is the material used in dental bonding which is not stains resistant as well as crowns and that the bonding materials are not as durable and strong as crowns, ceramic veneers, or fillings. Bonding materials can chip and break off the tooth. Dental bonding is widely used for minor cosmetic defects, for temporary correction of cosmetic problems, and to refine front teeth, where bite pressure is not high.